"They were forged for Mankind's darkest hour -- and that hour is upon us." “The Primaris Space Marines are a new breed of transhuman warriors developed across the span of ten thousand standard years by Archmagos Dominus Belisarius Cawl on Mars on the order of Primarch Roboute Guilliman. 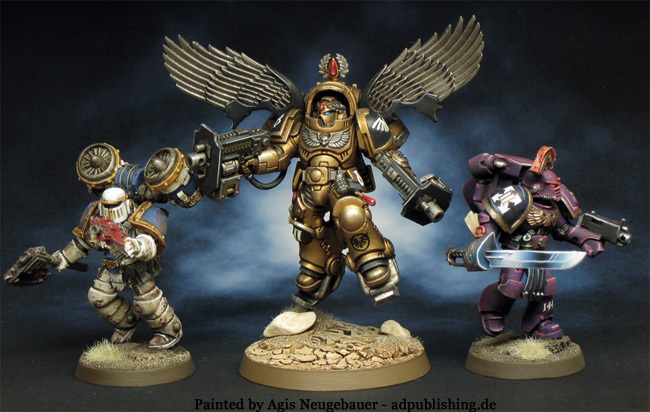 Cawl used the genetic template of the original Space Marines created by the Emperor for His Great Crusade as the starting point for the development of the new Astartes. 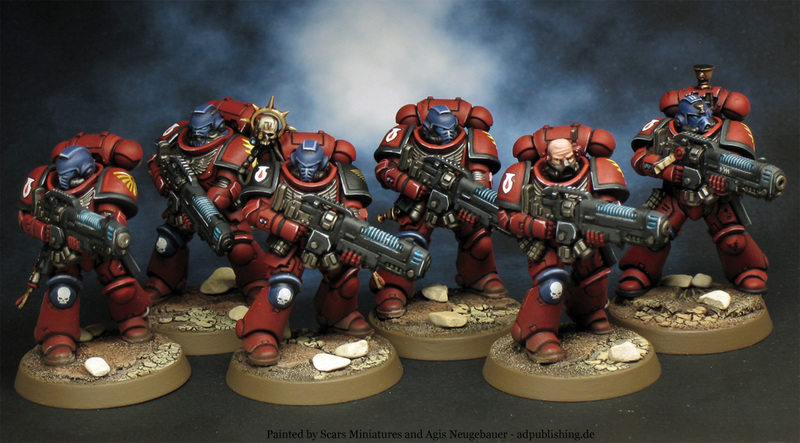 Primaris Space Marines are bigger, more physically powerful and possess faster reaction times than their original Astartes counterparts. For ten millennia, Archmagos Dominus Belisarius Cawl has been working on a task set for him by the Primarch Roboute Guilliman before he was mortally wounded by the Daemon Primarch Fulgrim in the days after the Horus Heresy: a new legion of transhuman warriors. 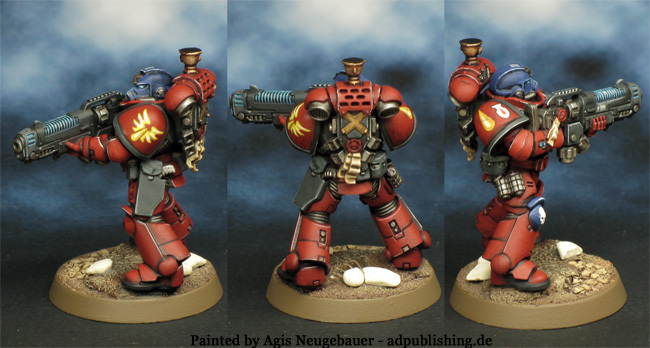 Developed on orders from Guilliman 100 standard centuries past, Primaris Space Marines were diligently developed and perfected by the Priesthood of Mars during the long intervening millennia. 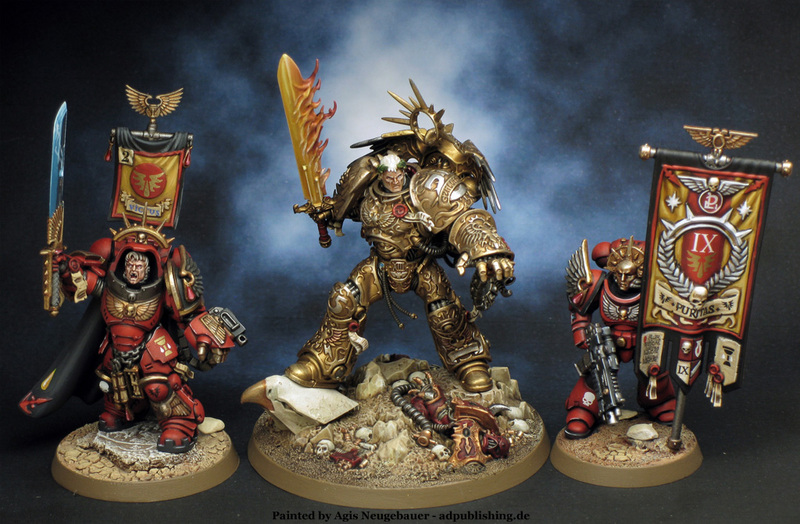 As an optimist, but never a fool, Guilliman learned from the mistakes of the Horus Heresy, and he foresaw that the Forces of Chaos would never relent in their aim to bring the Imperium low. He anticipated that devastating times would once again engulf the galaxy and knew that warriors resilient enough to stand against them would be needed as never before. That time has surely come. Now, as the Imperium of Man is poised on the brink of annihilation at the hands of Chaos, his task is at last complete. Finally, the new 40K has arrived! 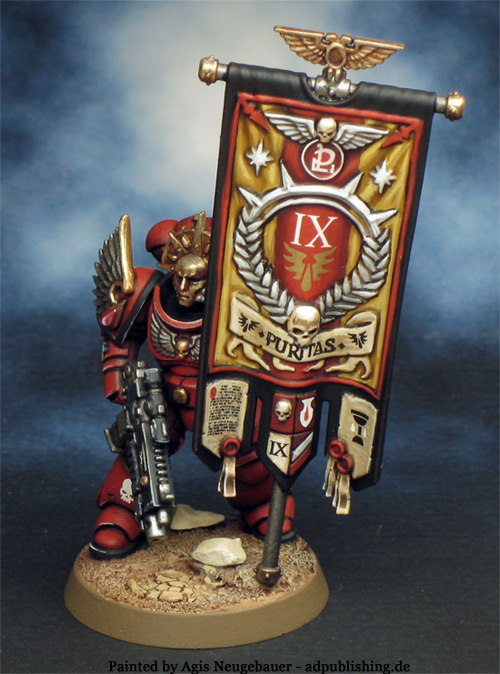 8th edition looks very promising, hopefully next week I have my 1st game. I was also very curious about the new Marines. So without any further blah blah, here is my 1st Primaris Marine. 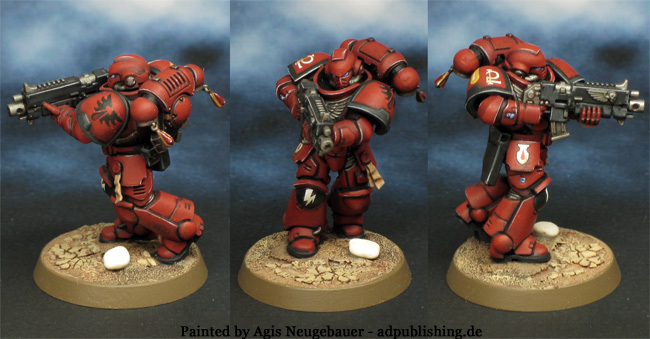 Primaris Intercessor Brother Marine of the the 2nd company, 7th squad. Right out of the box, only the head is an old Mk VI “Beaky” helmet. There was a lot of talk about head swaps, so I wanted to try it. 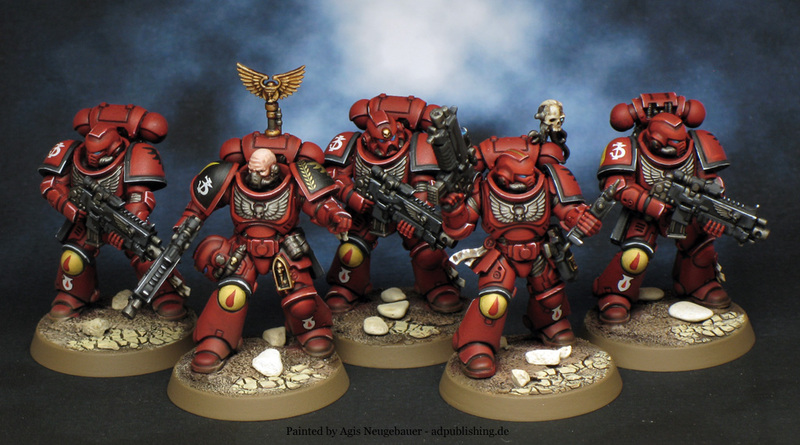 The Primaris are great minis, but are rather static, they are not as pose able as the older plastic Space Marine kits. 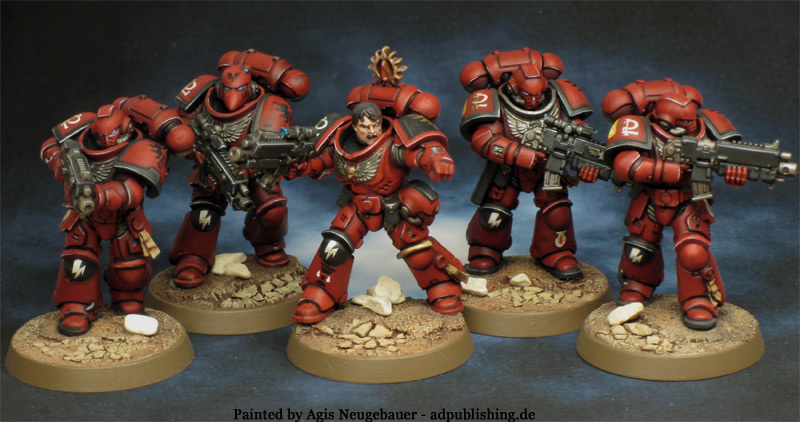 Primaris Intercessor Squad 7 Crassus of the the 2nd company. More details on the individual models below. 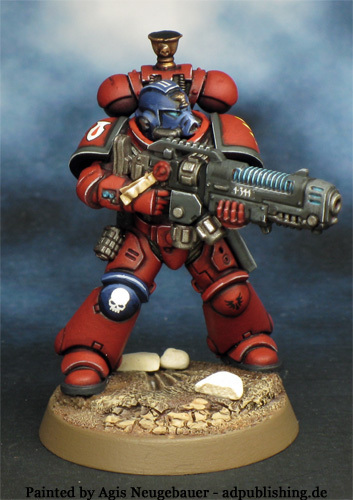 Primaris Intercessor Brother Marine of the the 2nd company, 7th squad. Again only a very minor conversion. I only used MkVII exhaust vents with BA droplets, the droplets were arranged to enhance the dynamic, forward feel of the skirmishing mini. 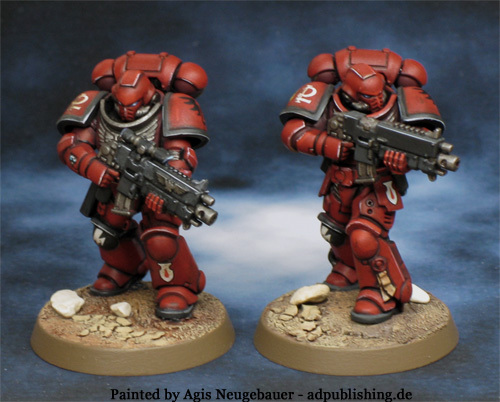 Primaris Intercessor Brother Marines of the the 2nd company, 7th squad. This time no conversion at all. 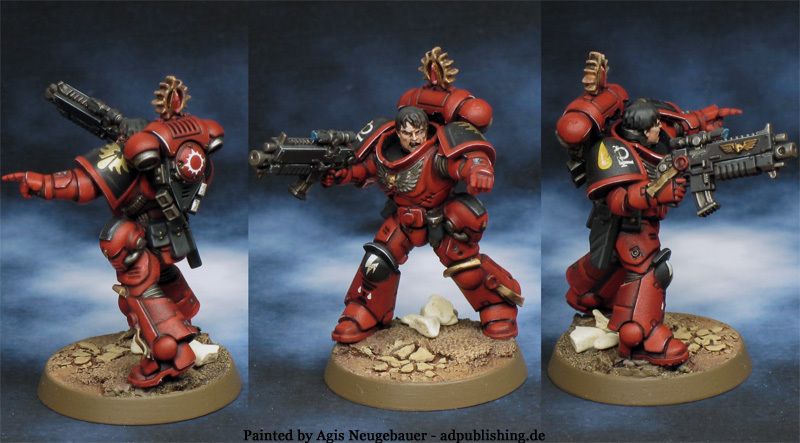 Primaris Intercessor Brother Marine Sergeant Crassus the the 2nd company, 7th squad. Again only a small minor conversion. The backpack received a Blood Angel icon and I used an Blood Angel head. Primaris Reiver Brother Marine the the 2nd company. Again a small minor conversion. The backpack, left shoulder pad and the helmet is from the Death Company box. I also painted him in DC colours. 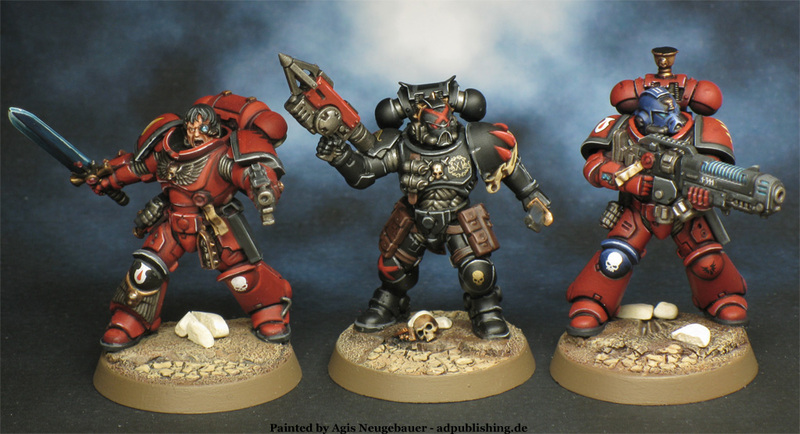 While Primaris are not effected by the Black Curse of the Blood Angels I decided that some Reivers will paint their armour as DC to honour their brothers. Where the Intercessors are the battle line heavy infantry of the Primaris Astartes, the Reivers are elite assault specialists given special training and wargear. Reivers are masters of terror tactics, breaking from stealth in a cacophony of Bolter fire, grenade detonations and guttural, Vox-amplified roars. Fits to DC too! For transfers I used Forge World BA. 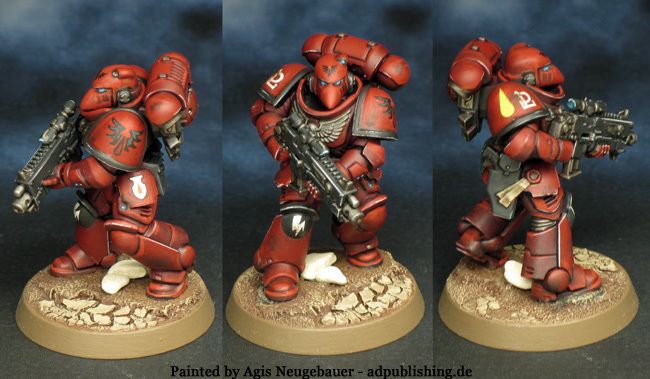 Primaris Intercessor Brother Marines of the the 2nd company, 4th squad. Build and converted by me, painted by me and (mostly) by Peter of Scars Minis. 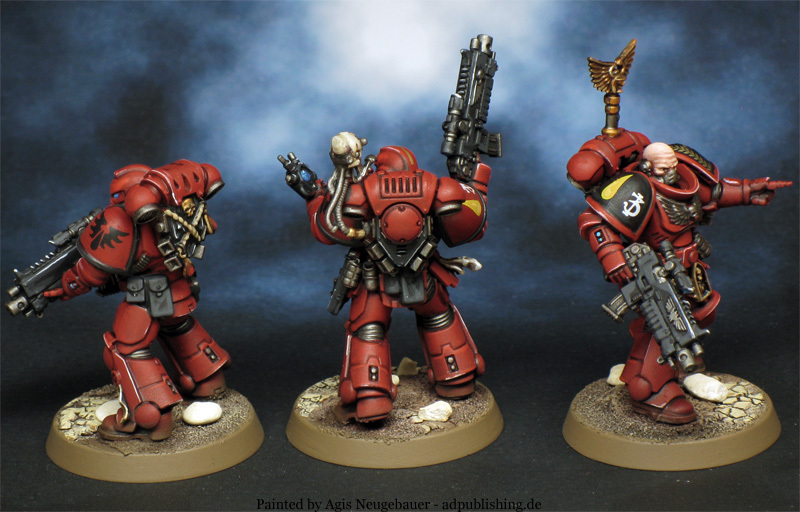 Primaris Intercessor Brother Marines of the the 2nd company, 3rd squad. Build and converted by me, painted by me and (mostly) by Peter of Scars Minis. 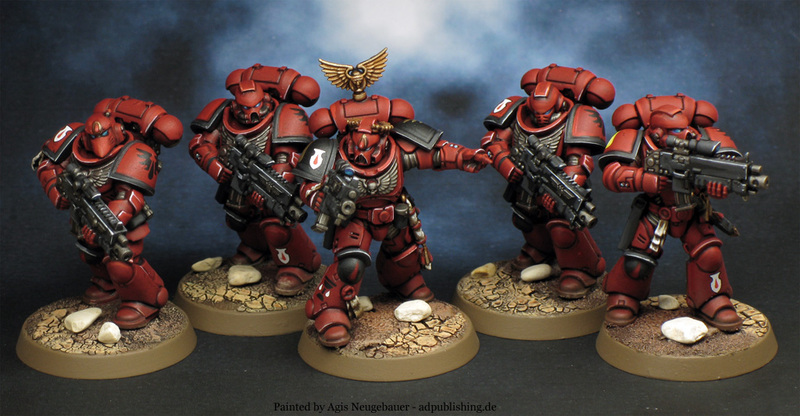 Another angle of the Primaris Intercessor Brother Marines of the the 2nd company, 3rd squad. I used a Death Company Backpack on the left Marine, a Servo skull on the Auspex Marine. 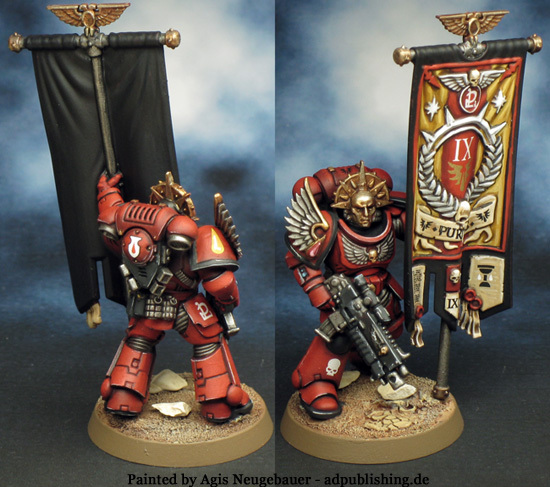 3rd Primaris, Ancient with Banner. Another minor conversion. Again a head swap, extra grenades and a wing on the right shoulder pad. With this model some extra effort was used, hopefully it shows. 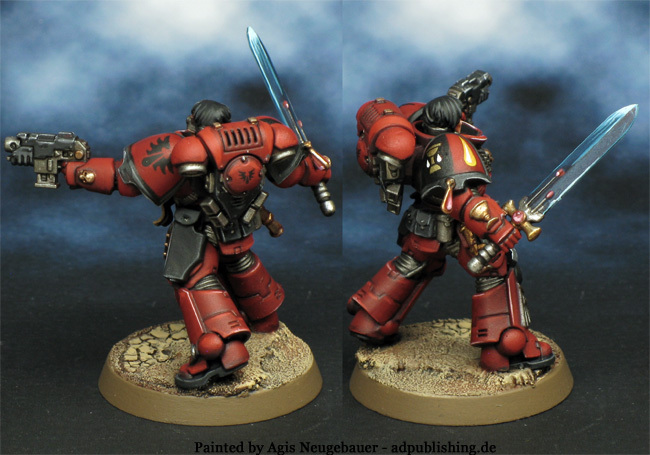 4th Primaris, Hellblaster Brother Sergeant Gabriel. Another minor conversion. Again a head swap (Mk IV BA), extra grenades and modified backpack. The full squad. Painted by me and (mostly) by Peter of Scars Minis. 5th Primaris, Brother Captain Victus. Another conversion. 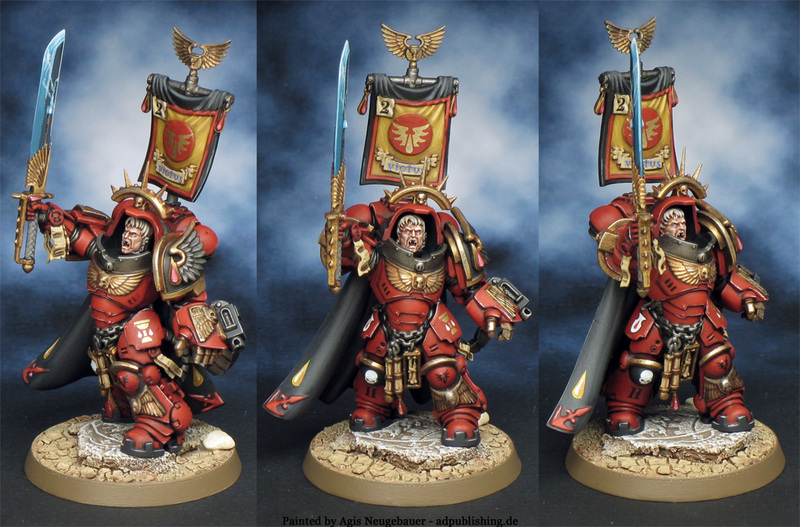 Again a head swap (BA Tactical Sergeant), sword from a Sanguinary Guard, extra purity seal at wrist, BA wing on left shoulder pad and the banner. I am happy how the conversion fits together. 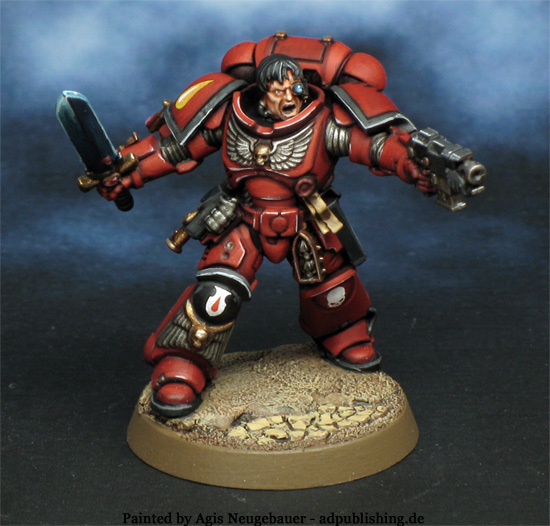 6th Primaris, Inceptor Brother Sergeant Angelus. Another conversion. 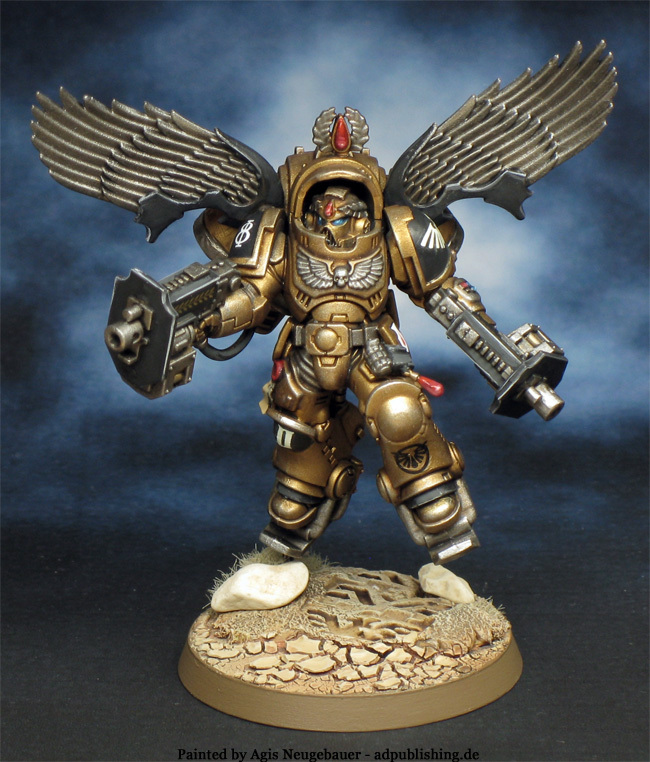 Again a head swap (BA Sanguinary Guard), wings from a Sanguinary Guard, grenade and pouch with blood droplet and BA icon on top of the “hood”. The hood was also a bit shortened to reduce the cover over the head, basically just to make the Mk VII head more visible. I am very happy how this all came together. Tanith Guardsman, Primaris Marine, Grey Knight and Eldar Ulthwe Guardian. 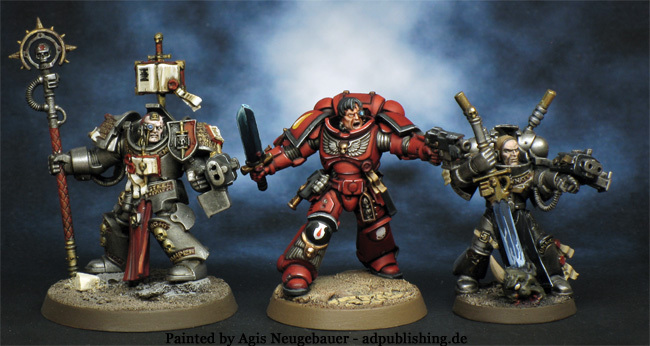 Grey Knight Terminator, Primaris Marine and Grey Knight. Vanguard Space Marines serves as a covert operator. These Primaris Astartes are ruthless killers, trained to operate behind enemy lines as saboteurs, assassins and infiltrators. Infiltrator Vanguard Marine of the Raven Guard chapter - build right out of the box, only a Mk VI helmet was used. Decals by Forge World. 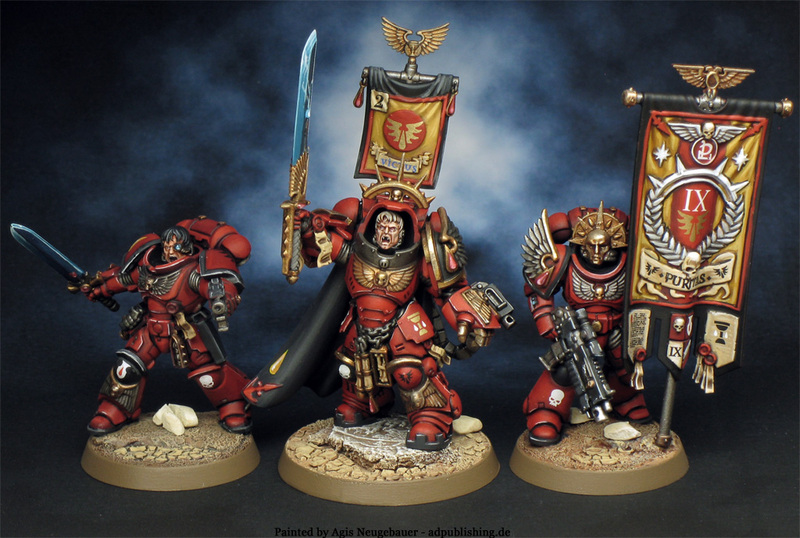 Vanguard Space Marines are not a single unit, but several different types of squads who perform different tactical roles for an overall Vanguard force. 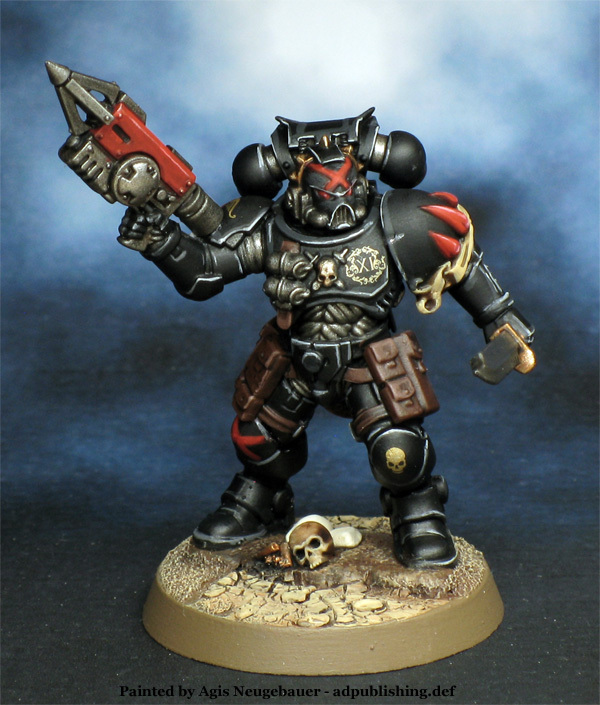 The primary squads found among the Vanguard Space Marines include Vanguard Infiltrators, Vanguard Suppressors and Vanguard Eliminators. The Mark X Power Armour worn by Primaris Marines is a marvel in design -a modular, adaptable system of ceramite plating that can be adjusted for multiple tactical roles, from the Phobos Pattern designed for scouting and reconnaissance and used by Vanguard Marines all the way up to the heavy Gravis variant worn by Aggressor Squads. Regardless of its pattern, Mark X Power Armour is designed to attach to a special undersuit worn by each Primaris Marine, enabling it to be fitted in different configurations according to need. Amongst the Vanguard formations, there is no standard Power Armour style, though Mark X Phobos Power Armour patterns are most common due to the nature of their combat doctrine. The armour adopted by Vanguard Infiltrators and Reivers, in particular, is this lighter variation of the standard Mark X pattern that offers increased manoeuvrability and quieter, almost silent movement because of lighter armour plating and servo-motors that run almost completely silent. 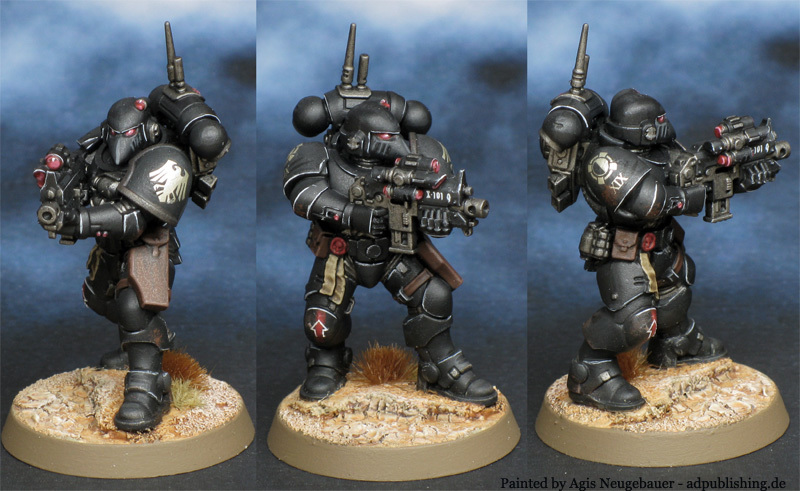 The Raven Guard is one of the original First Founding Chapters of the Space Marines and was originally the XIXth Space Marine Legion before the Second Founding and the adoption of the Codex Astartes. 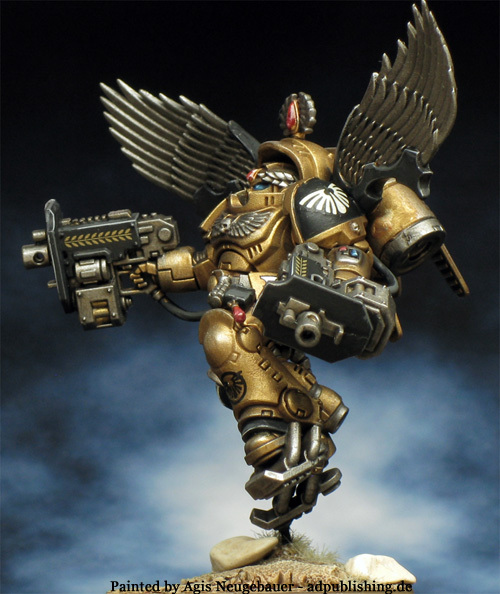 Named for a Terran avian seen by many cultures as the herald of fate and messenger of death, the Raven Guard have served the Emperor faithfully throughout the glories of the Unification Wars, the Great Crusade and the dark days of the Horus Heresy and beyond. From its earliest days, the warriors of the XIXth Legion were known as cunning and patient hunters, adept at biding their time until the moment to strike was at hand. When the Legion was united with its Primarch -- Corvus Corax, the Raven Lord, the Deliverer, theirs was a form of warfare exemplifying speed, stealth and precision which was codified into their doctrine, and under the ivory-skinned, shadow-eyed and sable-haired Primarch, the XIXth Legion carved its name in the annals of the Great Crusade. 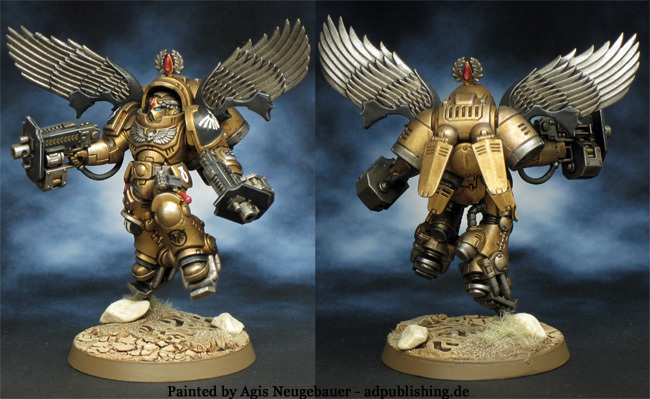 As the tragic histories of the Horus Heresy were recounted, however, the Legion's glories were to be scattered upon the black sands of Istvaan V during the Drop Site Massacre, and the Imperium was almost shorn of one of its greatest champions. 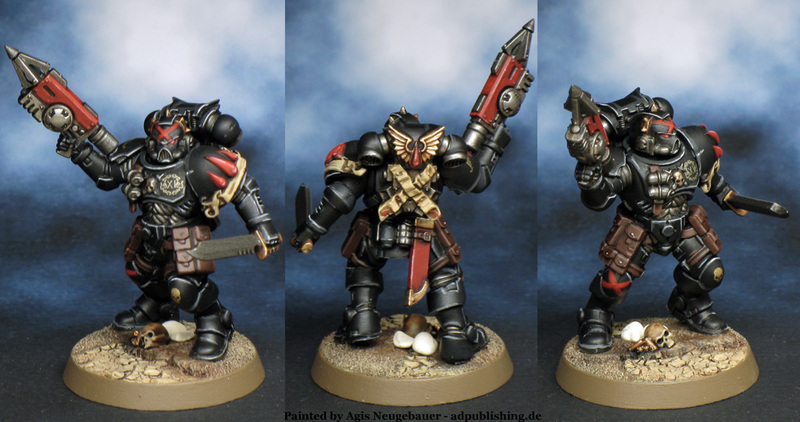 Though severely decimated, the Raven Guard would rise from the ashes of betrayal and go on to continue to serve the Imperium of Man as its protectors. As masters of the unseen war, they fight their battles with stealth and speed rather than fury and flames. For thousands of standard years, across thousands of worlds, they have continued to stalk the enemies of the Imperium as shadows of death, waiting for the perfect moment to deliver the killing blow before melting back into the darkness once more.